Compiled in 1968 by Worshipful Brother the Reverend Llewellyn Langley, BSc. The first Lodge to meet in Dover, of which we have any record, was Lodge No.262, constituted in 1761 at the Lord Granby's Head. Alas, it lasted eight years only. During the next fifty years several other Lodges appeared; one, the Lodge of Unanimity, was constituted at the Fox Inn, Dover, and one of the petitioners was a member of Peace and Harmony Lodge, a lodge working under a transferred warrant, and unfortunately, having no minutes until 1829. 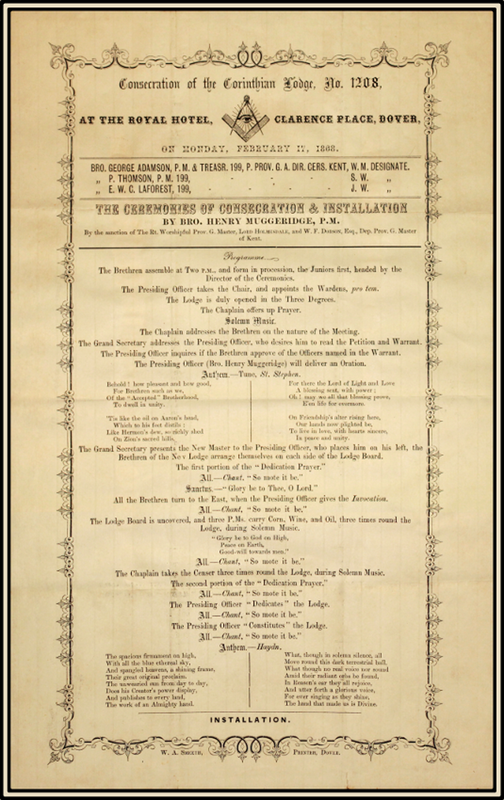 By 1860 this Lodge had over fifty members, and there was pressure for the formation of a new lodge, which pressure led to the birth of the Corinthian Lodge No.1208, on the 17th February 1868. Our origins are somewhat obscure, for no record appears to have been kept of founders' meetings. The Grand Lodge Librarian tells us we were sponsored by the Royal Navy Lodge No. 429 of Ramsgate, but the seven petitioners were all members of Peace and Harmony No.199 and eight members of the Royal Navy Lodge recommended the petition. A Record of the Consecration of the Lodge.